drive, or an even smaller USB flash drive or memory pen key or thumbdrive. 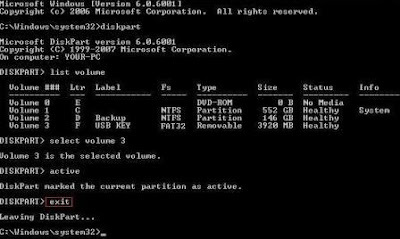 Windows 7 installation setup files over, which detailed in the guide below. via USB device. This support can be checked via BIOS. more. Portable external hard disk should also fulfill this requirement. 3. Windows Vista ISO image or Windows 7 ISO image. 4. Existing computer running Windows Vista or Windows 7. (diskmgmt.msc) to mark the partition as active. plugged in, the USB flash or hard drive will be Disk 1.
deal with the partition only. 4. Format the USB drive with the following commands one by one. Remember to replace the # with the actual disk number shown in step above. installation DVD ISO or disc. Replace y with the actual drive letter of the USB flash drive or hard disk. 4. Close the command prompt. of 64bit Windows 7 or Vista DVD to USB drive.